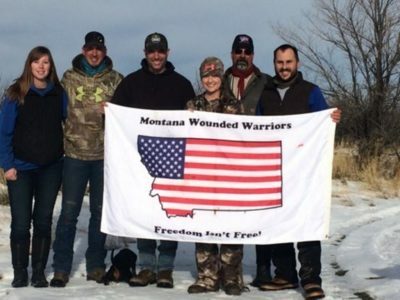 We are grateful for the continued support of the Ballard/Johnson plus other neighbors Montana Wounded Warriors hunt. 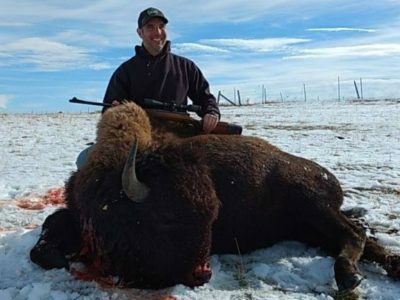 We have been doing this awesome hunt with them for several years now and we look forward to it every year. This year’s Wounded Warriors were Chris D’Angelo, Sam Bruner, and Bridget Bollinger. These three awesome Warriors met up with us at the Ballard Ranch and we started right from the go of teasing and having fun with each other. We sighted in the guns and got ready to do a quick spot before dinner. The evening was just a quick look before we hit it hard in the morning. We sat down for an awesome dinner and the Warriors got to meet everyone and share their stories to become a part of the family as we have done every year. We had a great time laughing and making fun of each other. 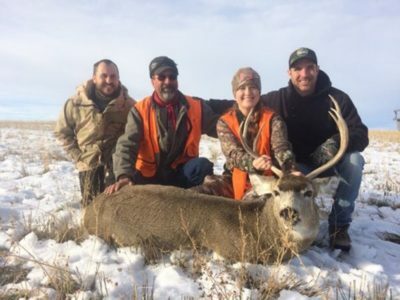 The next morning began with Bridget running with one guide and Chris and Sam sitting in some tree stands to watch the many deer come in from out of the fields. There were a few shooters but not a good enough shot presented itself yet. So we took the Warriors to the hills to look for elk. We saw a few cows running but nothing presented itself long enough to shoot. So lunch and more fun was had as we made a plan for the evening hunt. 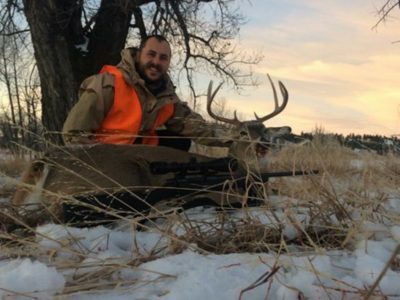 That evening turned out to be Chris’s chance and he shot a nice mule deer buck at an impressive distance. Bridget and Sam were in a tree blind and got to admire several deer teasing them but they couldn’t get a shot. We all went back for a huge dinner with all the land owners and laughed till our sides hurt. That next morning was Sam’s shot and he took it with his first whitetail buck. He was very excited and we were glad to be there with him. 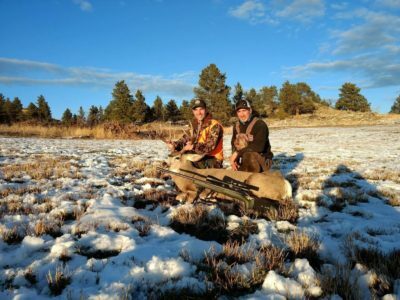 Bridget was just a few miles away putting the stock on a nice mule deer buck she dropped and that made it her first mule deer buck also. 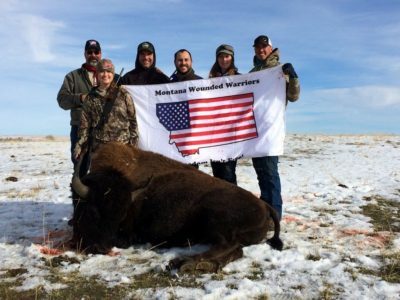 With that excitement done, we took the Warriors to the Ten Springs Ranch and the Warriors got to meet and pet Buffy the live buffalo. 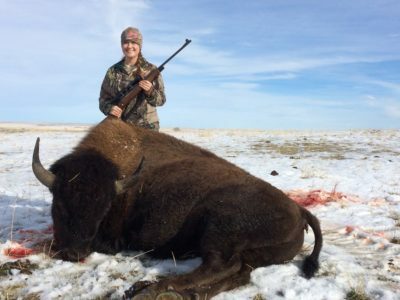 After that they went out and harvested their very first buffalo bulls. They were so amazed at the size and power of these animals. We had such an amazing time with the Ballard’s and this is one of the more personal and fun trips of the season. We cannot wait to do it again next year.